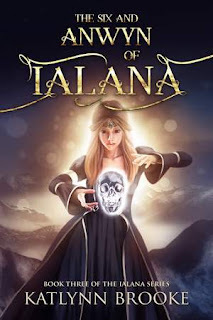 In the third book of the Ialana Series, thirteen-year-old Anwyn, the avatar daughter of Jarah and Tegan, possesses the keys to control a deadly weapon: a recently uncovered crystal skull created eons in the past. Astrabal, the underworld's demon-lord of Iochodran, will stop at nothing to gain possession and control of the weapon. Glahivar, an old and powerful enemy of the Six, is dispatched to Three Rivers, where the Six, and Anwyn, are under the protection of Queen Catrin and her husband, Ambros. The Queen and Ambros have problems of their own. A threat from the south by Moran, the war-lord of Yor Swamps, is in the making. Glahivar has no qualms in using the situation to her best advantage, to retrieve the skull, use it for her purposes, and—as a bonus—to end Queen Catrin’s reign. In a breathtaking race to the end, Anwyn and the Six must not only obtain possession of the weapon without killing themselves or causing a catastrophic event, but they must find a way to deactivate it, permanently. What is Anwyn’s connection to the weapon, and will she and the Six be able to prevent Astrabal and Glahivar from destroying the planet?